Roo's News from Rissy Roo's bring you the best of the best tips for getting ready and planning your perfect prom night. Stay up to date with fun tips on today's top hair styles, nail designs, how to create a prom time lime and how to measure yourself and choosing the right dress for your body type. With these awesome tips and other great ideas you are guaranteed an amazing night! Be sure to sign up for our newsletter so you stay in the know too! With the Prom 2017 season officially here, it's certainly time to start hunting for that perfect prom dress ( and shoes and accessories). There are so many choices, though. Where to begin? Lace? Open back? Cut-outs? Which dress designer? With so many new looks and trends becoming popular this season, there are certainly endless possibilities. While you can always check right here on our blog for all things prom, from top trends to styling tips, another go-to place is (of course) Seventeen Magazine for always on-point fashion ideas. If you haven't found it yet, they have a whole section dedicated to prom on their website! But, that's not what we're here to talk about today. We've recently teamed up with one of their Seventeen Style Pros, Morgan, to get her pick for the best prom dress of the 2017 season. Seventeen Style Pro Morgan chose Sherri Hill style 50873 as her prom 2017 dress of choice, and for obvious reasons - it's beautiful! See her thoughts on the Sherri Hill prom dress below. "Loving the freshness of this bohemian inspired Sherri Hill gown (Style 50873) in the newest spring shades of powder blue and blush. The embroidered bustier-style bodice is great for showing off your figure, while the flowy chiffon skirt, makes it comfortable enough to dance the night away. Add the matching choker for a touch of drama. Find this gorgeous dress and so much more at Rissy Roos!" We love Morgan's pick to get that perfect spring and summer vibe. One of our favorite parts of this look is the matching removable floral choker that comes with the dress. With chokers being so on-trend lately, it's a perfect way to bring the look to prom in a classy way. Morgan certainly knows how to choose a dress with style! Whether florals are on your mind, like style 50873, or there are other trends you have your eye on for Prom 2017, head over to our prom section to shop all the latest looks. This entry was posted in Prom Tips, In The News, Prom Dresses and tagged Prom Dresses, Sherri Hill, Prom, Prom dress, prom tips, Seventeen Magazine, Prom Trends, Prom 2017 on March 23, 2017 by Chrissy Roos. So, you're down to the final days and hours and you're still searching for that perfect prom dress. It's a difficult decisions... so many choices! Do you choose long?... short?... high-low?... two-piece?... open back? We certainly can't tell you what prom dress style is best for you, but we can surely help you find it! This week, we have one popular trend on our mind: lace! This entry was posted in Prom Tips, Lace, Prom Dresses, Trends and tagged Prom Dresses, Mori Lee, Sherri Hill, Trends, fashion trends, Prom, Lace Dress, Fashion Trend, trend alert, Prom dress, lace, Dress Trends, 2 Piece Dress Trend, Prom Trends, Trend of the Week, Spring trends, trend, Prom 2016, 2016 Trends, Angela & Alison on April 14, 2016 by Chrissy Roos. So, you have your prom dress, shoes, and accessories. All that's left is to decide on your hair and makeup. And, those decisions can be just as big as the dress decision! You'll want to choose a hair style that compliments your dress, and the makeup is all about what you're comfortable with. You can go to a makeup artist and get it done professionally, or do it all yourself. Since the professionals have you covered, today's post is all about creating that perfect prom makeup look yourself! Youtuber Melissa Allen recently posted a drug store prom makeup tutorial, and we're loving her makeup picks. She called it a drugstore haul because all of the makeup that chose chose can be found at your local drug store, and she tried to keep all of her choices under $10. So, if you're looking for a last minute makeup look, or need a makeup look on a budget, Melissa's video is a great one to take pointers from. Check it out below! This entry was posted in Makeup Tips, Prom Tips and tagged Video, Prom, makeup, prom tips, makeup tips, prom makeup, Make Up, How To, diy, do it yourself, Prom 2016 on April 12, 2016 by Chrissy Roos. As the old saying goes, hindsight is 20/20. No matter what the situation or event, it always seems like there's certain things you wish you knew before hand that may have resulted in you making different decisions. Well, prom is no exception to this rule. It's a big day with lots of planning, and one where you tend to have high expectations. While you always hope that prom day will go exactly how you envisioned it for months, that's usually now how the day actually goes down. That's why we were happy to see that 20-year-old Olena of YouTube fame, known by her YouTube name IamJustaMakeupLover, listed out the 10 things that she wished she knew before attending her prom. She explained that she had planned her prom day out schedule by schedule, hour by hour, but things tended to veer off course a little. Watch the video below to see what she wished she knew before attending prom. Below a quick run-down of everything to know before going to prom, from Olena's video. Olena said she gave 10 tips, but we actually heard 11 great prom day tips from her! Things will go wrong - go with the flow. Don't stress out over your date; if you're not in a serious relationship or don't have a BFF you're going with as a date, your date really only comes into play when it comes to the pictures. You'll be dancing the night away with your friends the rest of the time! It's okay to not have a group. You'll see your friends at prom, and don't worry about the pictures so much. Uncomfortable shoes are optional! You'll most likely be wearing a long dress where you won't even see your shoes, so choose ones that are comfortable for 5 hours of being on your feet and adjust your dress to those shoes. Make sure you do your hair in a way that's comfortable. Do a makeup test run. Even if you go to MAC or Sephora, you could end up with a look you're not comfortable with. When you do the test run, take pictures with your eyes closed, eyes opened, and to the side so that the look can be easily re-created by anyone. False eyelashes are a must! They look great in pictures. You're supposed to look fabulous at prom, after all! Also, remember to use waterproof mascara because there may be lots of crying! Don't trust your makeup artist on their artistic vision - know what you want and tell them! Olena recommends going with a natural, bridal inspired look, perhaps that's a little more dramatic and smokey. Have a backup place for your pictures - have an indoor, and outdoor, and another indoor. It may rain on your prom night, or schedules may end up being re-arranged. Don't feel like you need a stretch limo. A small limo or even a black car is fine (our tip: you could even have fun in a sports car, like a Mustang, if you or a friend own one!). It's just a ride! You may also want the ride to take you from prom to wherever you're going after-prom. Have fun, it's a celebration! Dance and have fun with your friends because you won't see them for much longer with school ending and going off to whatever comes next for you after high school. One last tip from us: while it's of course important to simply go with the flow come prom day (just like Olena mentions), start thinking of your prom day as early as possible to try to prevent as many unwanted surprises as you can. Olena's tips will certainly help with this! Good luck on your special day!! This entry was posted in Prom Tips and tagged Prom, prom tips, prom hairstyles, Prom Hair, makeup tips, prom makeup, Prom Night, tips, prom ideas on March 31, 2016 by Chrissy Roos. Finding that perfect prom dress to stand out at prom is a mission that can take a gal months. Two-piece? Lace? Open back? High-low? So many styles and trends to choose from. Well, we have one new trend to add to your list that is as unique as it comes! Many celebrities have been rocking the trend lately, and Selena Gomez is the latest. The trend is capes. Capes, cape dresses, and capes as dresses is a look that has become more and more popular in the fashion world, and the look can now even be found in prom dresses. Selena recently wore the hot new trend while out on the town in Paris. The celebrity wore an elegant black Vionnet dress with a chiffon cape over top of it. It's a totally dramatic, yet so classy look that gives a whole new name to wearing a ball gown. This entry was posted in Celebrities, Prom Tips, Best Dressed, Prom Dresses and tagged Prom Dresses, Trends, celebrities, fashion trends, celebrity, Prom, Best Dressed Celebrities, Fashion Trend, trend alert, Celebrity Inspired Dresses, Prom dress, prom tips, selena gomez, Dress Trends, Celeb Style, celebrity style, Celebrity Fashion, celebrity dresses, Trend of the Week, trend, Prom 2016 on March 18, 2016 by Chrissy Roos. 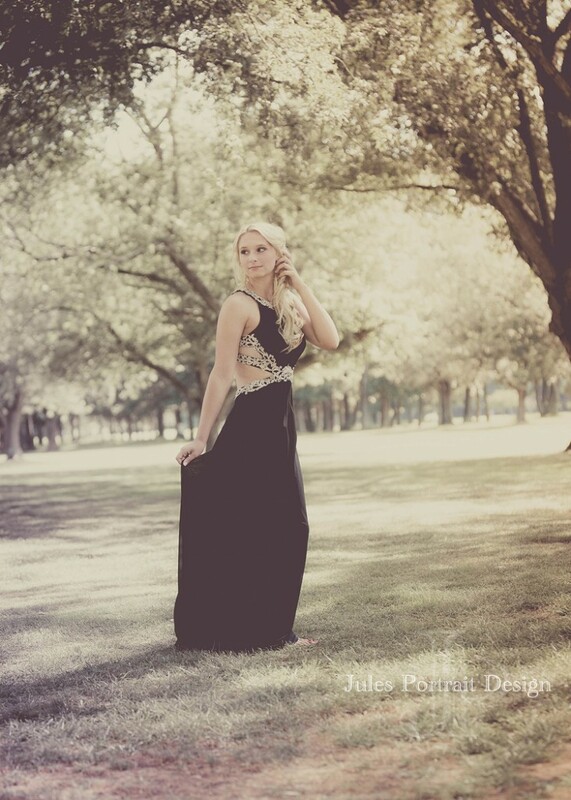 Beautiful High School Senior Pictures In Your Rissy Roo's Dress! Obviously, one of the most important parts of your senior year is finding that perfect prom dress and making sure everything is in place for the most magical prom night ever. Of course, another important part of senior year are your senior portraits. While the school senior portraits are always an important part of senior year, there are certainly more fun and memorable ways to take senior pictures now, and one way is in your prom dress! This entry was posted in Prom Tips, Prom Dresses and tagged Prom, High School, prom pictures, High School Prom Dress, High School Prom, photography, photos, Prom 2016 on March 7, 2016 by Chrissy Roos. The Amount Teens Are Spending On Promposals in 2015 is Unbelievable! Well, it's official: promposals are the best thing since sliced bread (and by sliced bread we mean a beautiful prom dress) when it comes to prom. A new nationwide study released by Visa Inc on March 31, 2015 shows just how popular promposals have gotten (by the way, if you want an 'official' definition of a 'promposal,' Visa describes it as: "elaborate invitations to the high school prom that can mirror a marriage promposal."). Believe it or not, promposals are costing the average American household with teens $324 in 2015! Gone are the days of a simple note on the car of the person you plan on asking. "Promposals have become significantly more extravagant in recent years and now represent in excess of one third of the $919 total that the average prom-going teen will spend on the dance in 2015....While total prom spending is down 6% this year from the $978 that parents and teens forked over in 2014, Visa added the category of promposal spending for the first time to the company's annual survey." Just a few days ago, we had mentioned in a blog post how popular promposals have become this year. This survey certainly proves it! Visa notes that the average prom-going teen will spend $919 total in 2015; this means that just the prom proposal is one third the total cost for the average prom-goer this year. 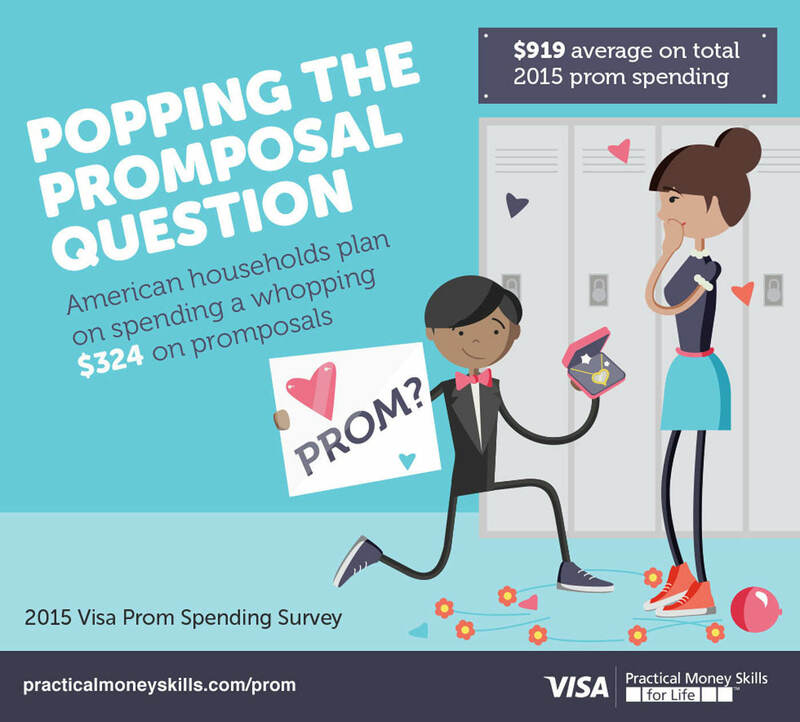 While promposals are so much fun and definitely worth the time and effort to put into creating one, we have to agree with Visa's head of U.S. Financial Education, Nat Sillian, that spending $300+ on a promposal may be a little overboard. Visa has the tools to help out, though! Visa offers a free Plan'it Prom App to help teens plan out their entire prom extravaganza on a budget. Visit PracticalMoneySkills.com/Prom for how to download the app for iOS and Android devices. This entry was posted in Prom Tips, Promposals, In The News and tagged prom tips, In The News, tips, promposals, promposal, Prom 2015 on April 8, 2015 by Chrissy Roos. Roo Girl Janey's Surprise Tennis Court Promposal! There have been so many unique promposals this year, from a promposal delivered by police to a high schooler asking an Eagles linebacker to prom. With promposals and prom in the air, we're so excited to share a new promposal with you. Why is this one so special? It came from one of our very own Roo Girls! Janey, who is one of the Roo Girls that works at the Rissy Roo's store in Linwood, NJ, is a student at Atlantic City High School and her Senior Prom is fast approaching. Since it's her senior year of high school, of course she has to go out with a bang, and she's off to a good start since she was asked to attend prom by way of a promposal! Ready for how this adorable picture came to be? Janey plays on the girls tennis team at ACHS, but is also the manager of the boys tennis team. The boys coach called her and asked her to come to practice to help with a couple of things for the team. When she arrived, the coach asked her to take some pictures of the team... and of course first they wanted to have a shirtless picture taken. Five of the boys took their shirts off, and when they did, their chests spelled out, "PROM?" Then, her friend Danny came out, handed her bouquet of flowers, and asked if Janey would attend prom with him. Of course, Janey said, "YES!" Such a cute promposal! Since both Janey and Danny are tennis players, could there be a better place than a tennis court for their promposal to take place?! And, Danny getting his teammates and even his coach involved in the promposal is super impressive! We give this tennis promposal the Roo Girl approval all the way! We can't wait fir Janey and Danny to finally attend prom together and hear how amazing their night was after it's all over! This entry was posted in Prom Tips, For Fun, Promposals and tagged Rissy Roo's, Roo's News, prom tips, promposal ideas, promposals, fun, prom fun, promposal, prom ideas, Prom 2015 on April 6, 2015 by Chrissy Roos.